"My wife and I are bow hunters," my patient said. 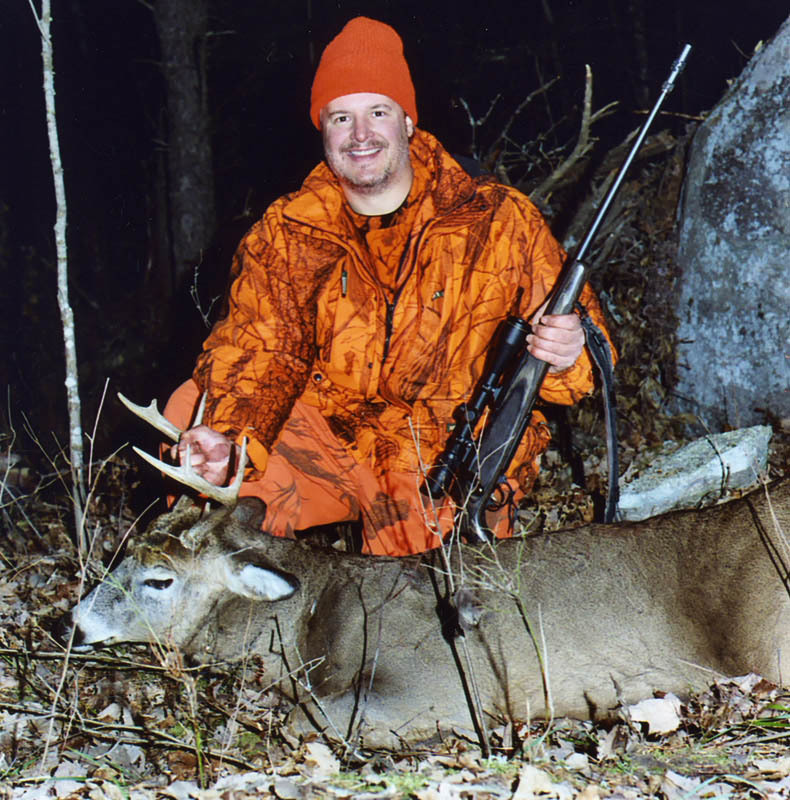 "While hunting last year (1969), I decided to try sitting on a branch in a big pine tree, It wasn't comfortable, but before long a big 10-pointer came along and stopped on the deer trail below me about ten feet away. It was an easy shot with my long bow. Last week my wife and I both got bucks while sitting in trees." That was the year I planned to introduce my two oldest children, Peggy and John, to deer hunting (antlerless deer illegal back then). My hunting area then was a vast wilderness with one muddy logging trail coursing through the center. In years past, several deer hunters had become lost there for one or more days. Two were never seen again. Nailing platforms made from branches and slender tree trunks teween trees for my kids, adding ladders, seats and railings and giving them strict orders to remain there until I came back for them seemed like an ideal way to eliminate the worry of turning them loose in this forbidding region. Shortly after first light on opening morning Peggy raised her .410 shotgun loaded with a single slug and shot a nine-pointer standing only eleven feet from where she sat (see photo). 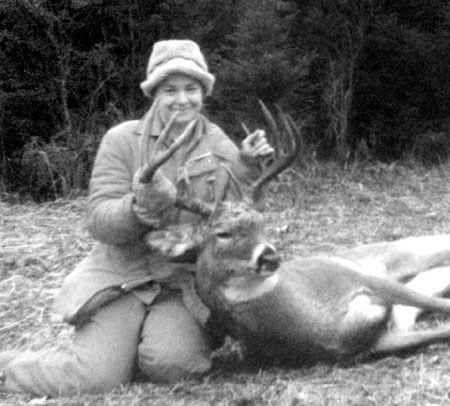 Peggy with her .410 and 9-pointer. Four of my children took bucks from similar tree stands during their first or second hunting seasons. 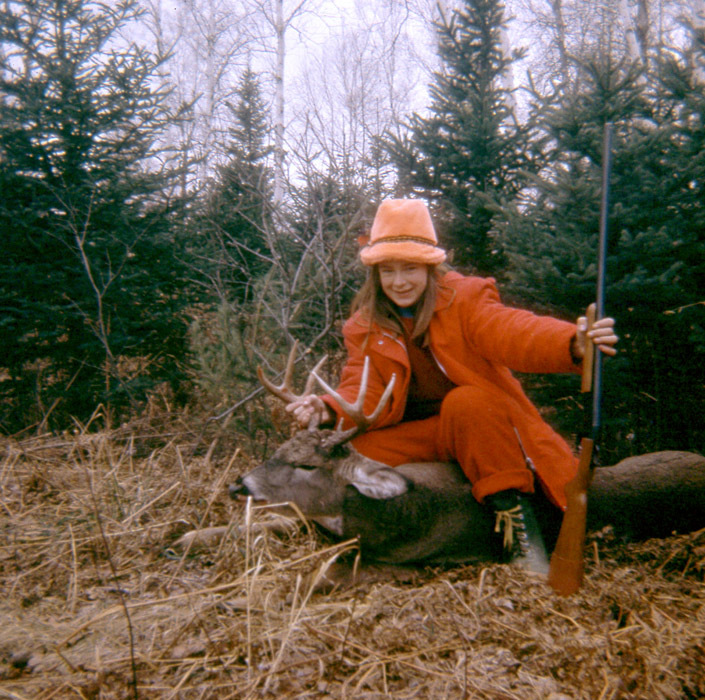 Peggy dropped a monster ten-pointer, the second largest ever taken by a Nordberg, from another of our primitive stands during her second hunting season (see photo). 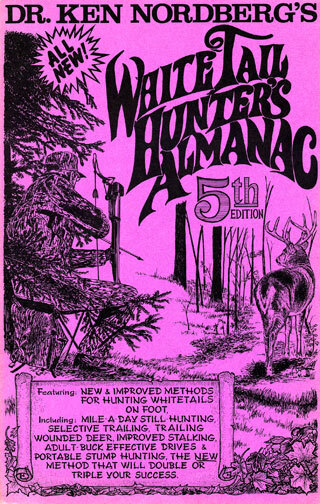 1970 was also the year I began earnestly studying whitetail habits and behavior, made surprisingly easy by my first tree stands. 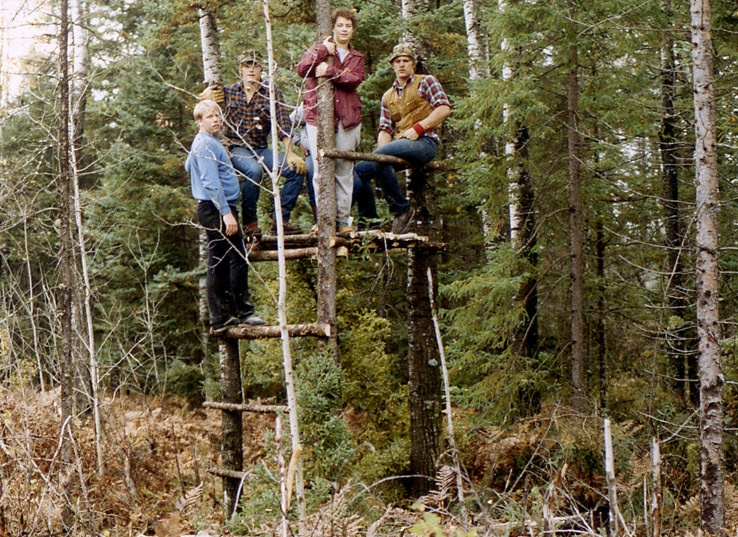 No one I knew or read about used tree stands of any kind at that time. While sitting in these stands we commonly observed up to 20 unsuspecting deer per day at amazingly short range. Beneath our six-foot-high platforms, deer commonly fed on grasses or browse and laid down mere feet away to chew their cuds. It always seemed strange back then that whitetails failed to notice us, even while they were downwind. As we eventually came to realize, they were not intimidated by our scents if they could not see or hear us on the ground. 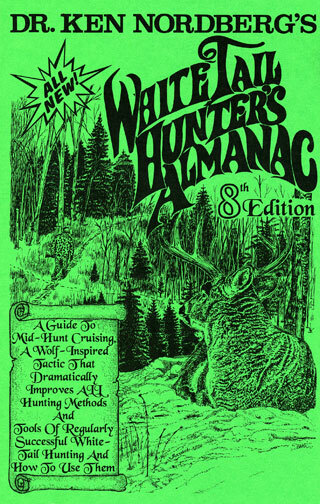 When the use of elevated stands began to spread to other regions in America inhabited by whitetails (largely as a result of my many magazine articles and sport show seminars on the subject), one outdoor magazine writer even suggested the anatomy (bones and muscles) of a deer's neck made it impossible for them to look upward. Example of one of our higher tree stands. This helpedfor a while. By the end of the 1980s, numbers of unsuspecting deer seen per day from our elevated stands had diminished considerably. 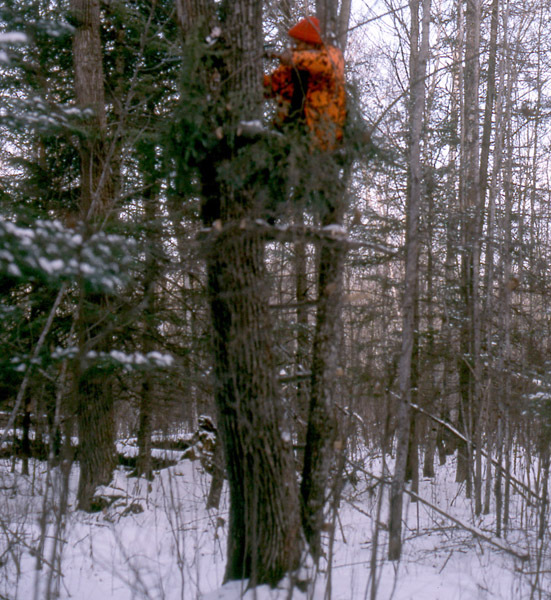 Placing our platforms higher in trees, tacking evergreen boughs completely around them to hide our silhouettes and changing stand sites every 3-4 days improved matters for a couple of hunting seasons, but the heyday of treestand hunting as we knew it back in the beginning was obviously coming to an end. By no means am I suggesting treestands are no longer effective for hunting whitetails. They just aren't as good as they once were. 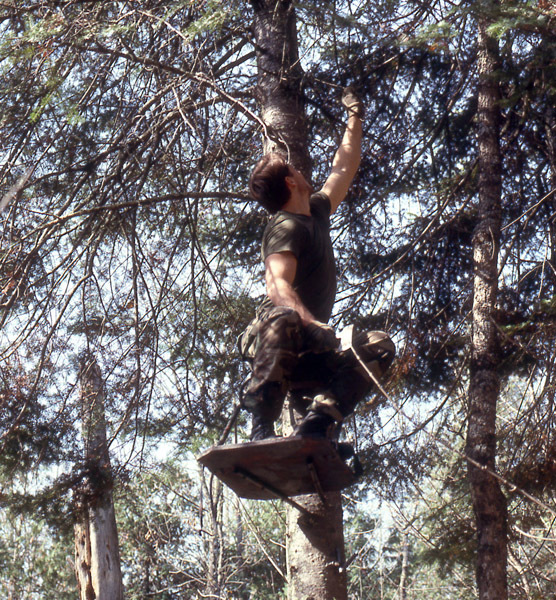 In 1985 we began using portable treestands, chain-on and climbing types, both impossible to carry and place in trees whithout making worrisome thumps, rattles and clanks (see photos). Deer tracks in snow revealed some older bucks were widely detouring around sites where these portables had recently been placed without ever having passed near enough to see them. Inadvertant metallic sounds made while carrying and installing them were the likeliest culprits. Similarly, some older bucks began avoiding our portables after passing within sight of them only once whether occupied by a hunter or not. 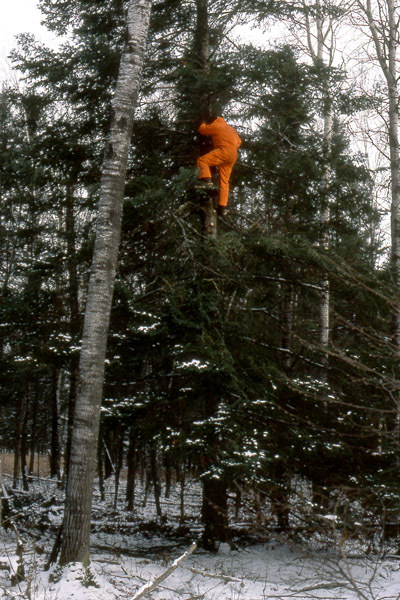 By 1990 it had become obvious many experienced adult whitetails (two years of age or older) of both sexes were now recognizing man-made stands in trees and were aware of their danger. 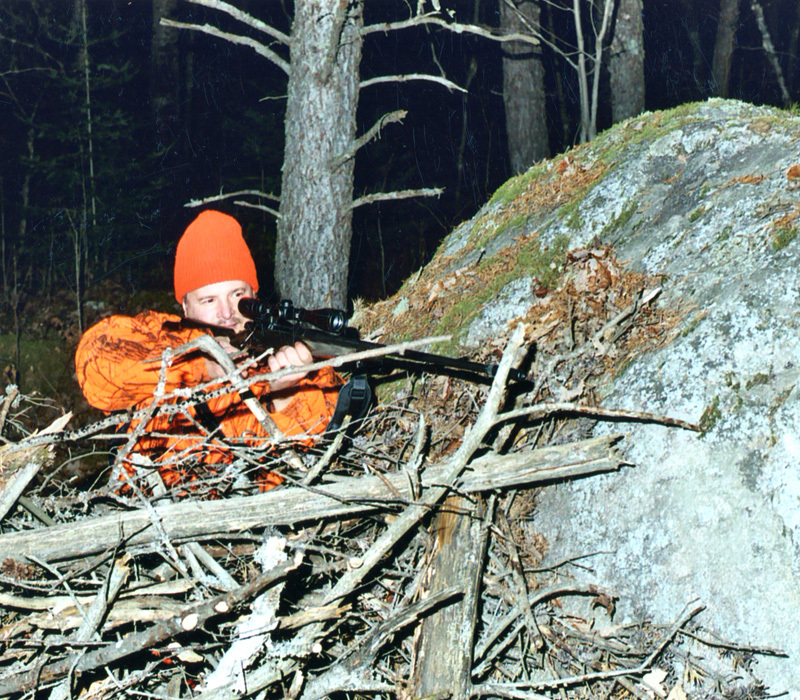 On the final day of Minnesota's 1990 firearm hunting season, I decided to try using a backpacked folding stool at ground level. One half-hour before first light I placed it amid young evergreens atop a granite outcropping overlooking a whitetail browse area discovered several days earlier, currently full of very fresh deer tracks and droppings. At 7 AM I gave my buck grunt call a try. Almost immediately a doe emerged from a nearby spruce thicket, followed closely by a 9-point buck. After a second grunt, the doe headed straight toward me and a few minutes later I dropped the buck in its tracks 20 yards away. It then occurred to me I was on to something new and exciting. I had carried that stool 1-1/2 miles from camp without it making a single unusual sound. When I reached that outcropping (downwind of the feeding area), though I had never hunted there before, aided by the careful use of a small flaslight I had no trouble finding a spot to sit where deer in the feeding area would be very unlikely to spot me. Young evergreens 3-6 feet tall provided a solid, silhouette-masking background behind me and motion-hiding cover (to hide the raising of my rifle) in front of me. The bright color of the skin of my face was masked by a camo headnet (cap on top). 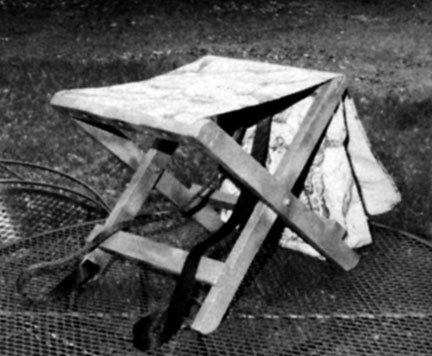 The stool had remained completely silent when I slipped it off my back, opened it and placed it on the ground. The seat proved to be much more comfortable than any on my treestands, frequent squirming to find a more comfortable sitting position a thing of the past. Though I had no prepared shooting lane, a small natural opening was all I needed. All of this combined to create a stand site equal to the best I had ever used before whitetails begain looking up into trees for humans. Every buck I have taken since that day was shot while I was seated on my homemade wooden-legged stool which is now 22 years old. Most important for anyone reading this article is this: the physical characteristics of the stand site decribed above, plus one not yet mentioned, make it mature-buck-effective. 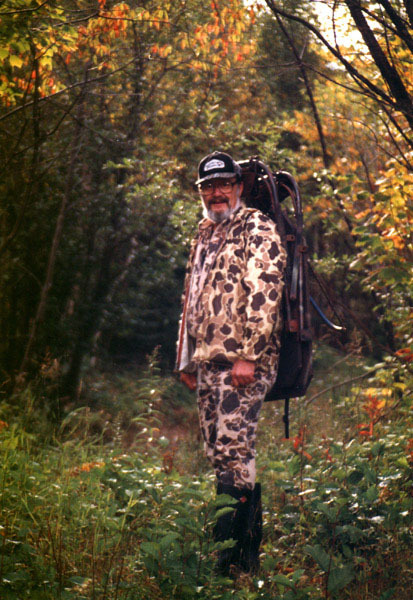 Doc walking through the woods wearing his portable buck hunting stool. The unmentioned part is a proper approach trail, typically in my case an existing deer trail cleaned up a bit. Throughout the section of trail within 100 yards of a stand site, a proper approach trail must be silent enough underfoot to make it difficult for nearby whitetails to positively identify the approaching hunter via hearing. It must course through cover dense enough to make it difficult for nearby deer to positively identity the approaching hunter via sight. It must be downwind or crosswind, making it impossible for whitetails ahead to identify the approaching hunter via smell. When not positive about the identity of an approaching creature, whitetails do not react with great alarm. They become curious, however. If after the hunter arrives at the stand site nothing more is heard or seen, their curiousity trypically wanes, usually within 15-30 minutes. Thereafter it is unikely they will deliberately avoid moving toward the the hunter's stand site. The greatest advantage of using a stool to hunt whitetails is the ability to change stand sites quickly and with relative silence at any time. My partners and I hunt mature bucks only, whitetails that identify and begin avoiding human hunters much more quickly than other deer, This being the case, we change stand sites nearly every half day. A stool makes it easy to accomplish this without alarming nearby whitetails. As a rule we only sit near a trail or site where very fresh tracks and droppings made by a big buck are located, a spot where that buck is most likely to be near right now, later today and tomorrow morning. Hunters who use portable tree stands cannot easily move their portable to new stand sites without alerting or alarming nearby deer, if at all. My hunting partners and I hunt bucks in two stages. To insure intended quarries will be back in their home or breeding ranges on opening weekend, doing predictable things at predictable places during predictable hours, we use 4-5 stand sites near deer signs made by older bucks selected 2-3 weeks before the hunting season begins. These stand sites are intended for use during the first two days of the hunting season (stage 1). Beginning on day-three (stage 2), we hunt at stand sites near trails and sites used by mature bucks right now, today, locations revealed by their very fresh tracks and droppings. Where necessary (where natural cover at otherwise ideal stand sites is inadequate), we consruct blinds at stand sites intended for use opening weekend. Stand sites used after that are almost always at sites never used before, making use of natural blinds (unaltered cover) near trails or sites currently used by big bucks. We do not construct blinds during hunting seasons because it generally takes 2-3 weeks before older bucks will quit avoiding them. Here is an example of using natural cover. John with his "at 3 feet" 8-pointer. John shot this smaller 8-pointer from a distance of 3 feet. You can see his natural ground blind in the background. When he shot his buck, John was wearing a camo face mask. His ground blind amounted to a boulder and pile of dead branches. He was sitting on his portable stool on the opposite side of the brush with his back against the boulderfacing to the left. This particular boulder was ideal because it was a few inches taller than John's head. Thus, deer approaching from the opposite side of the boulder could not see him. This detail became important because this buck did approach John from behind the boulder. The buckwalking from right to leftpassed directly in front of himright where he is laying in the first photo. Because the deer was only 3 feet in front of the end of his barrel, he had little time to identify the deer as a buck and shoot. Essentially, it was a case of, "Antlers? Yes." Pow. Man-made blinds have been my bane ever ever since I began bowhunting in 1960. I've tried using everything to make them from camo netting and log palisades to pits, haybales and rocks, but I'm still certain I have yet to discover the best possible blind for hunting older bucks. Only last year after my son, John, and I constructed 16 new blinds around several clearcuts (a new study), whitetails again taught us another lesson: blinds should not be constructed right at the edges of clearcuts (and probably farmfields as well). We saw no deer from blinds constructed at edges while hunting last November. We saw deer every time we used blinds located 10-25 yards back in from edges in adjacent forest cover, constructed about some notable natural feature such as a large fallen tree or large boulder. Between 1990 and 2012 our most productive blinds were fairly solid structures, chin-high-to-a-hunter-seated-on-a-stool, u-shaped stacks of natural materials found lying on the ground in the immediate vicinitymostly dead branches, logs and trees. Long ago we learned branches, logs and trees with fresh-cut ends should not be used. 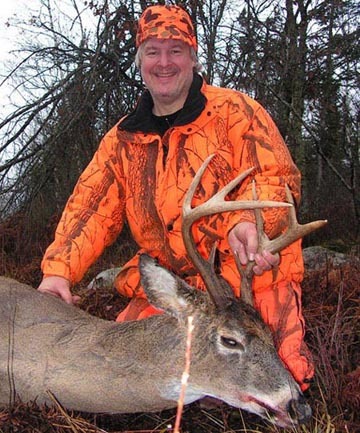 Brightly colored ends tend to attract the attention of passing experienced adult deer of both sexes, making any movement made by the hunter's visible head and arms while raising a gun or bow much more likely to be spotted by deer short distances away (eyes of whitetails are very sensitive to motions). Our blinds are u-shaped because we have learned the hard way bucks and other deer approach a blind from either side at least half the time. Blinds are only productive if used properly. Deer hunting is not like duck hunting when you can set out decoys, construct a blind and then sit back and expect to see ducks soon. If you have constructed your blind in the right place (where deer are sure to be near), next to a feeding area, for example, it is unlikely you can reach your blind without at least arrousing the curiousity of nearby deer, which will last 15-30 minutes if you are downwind or crosswind and remain silent and motionless after you get to your stand. My hunting partners and I always get to our stand sites about thirty minutes before first light in the morning (one hour before sunrise), moving as silently as possible. We silently set our stools on the ground, put on our camo headnets (blaze orange cap on top) and then sit very still until first light, one half hour before sunrise and the beginning of legal shooting time. We thus don't ruin or miss a minute of the most productive hunting hour of the day, the first legal shooting hour of the day beginning thirty minutes before sunrise. Until we take a deer, we continue sitting very still until 11AM. We then head non-stop back to camp for lunch, eyes on the trail ahead (searching for more very fresh tracks or droppings of a big buck). We head to our afternoon stand sites between 1 and 2 PM. At this time it is relatively easy to see where we are stepping, thus able to move with adequate silence along connecting deer trails. 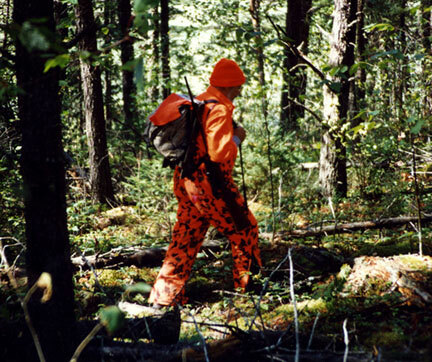 At this time it is also realatively easy to select stand sites amid natural screening cover near the trail or site where very fresh tracks and/or droppings of a big buck were very recently discovered. When a feeding area is our destination in the afternoon, we approach from crosswind and sit crosswind because deer will likely approach the feeding area later from downwind. In the morning, we generally approach from downwind because whitetails will already be there, usually beginning feeding around 4 AM. In wolf country whitetails commonly quit feeding and head back toward their bedding areas about 9 to 9:30 AM. Because they do not always stick to this schedule, we nonetheless remain at our stand sites until 11AM. As commonly, our wolf country whitetails wait until sunset to begin feeding again. We get to our afternoon stand sites much earlier, nonetheless, because feeding sometimes begins earlier and bucks searching for does in heat might appear at any time during the day. We always remain at our afternoon stand sites until the last minute of legal shooting time ends, thirty minutes after sunset. We have taken a fair number of bucks while it was becoming difficult to spot them during that final 5-10 minutes . There is more to learn about stand sites, of course, before you can begin to enjoy the best buck hunting of your life. For example, you must how to scout for deer signs during hunting seasons that reveal where to hunt bucks or other deer later today and tomorrow morning without alerting or alarming deer, thus improving the odds they'll be near when you return. This will be explained in detail next month.